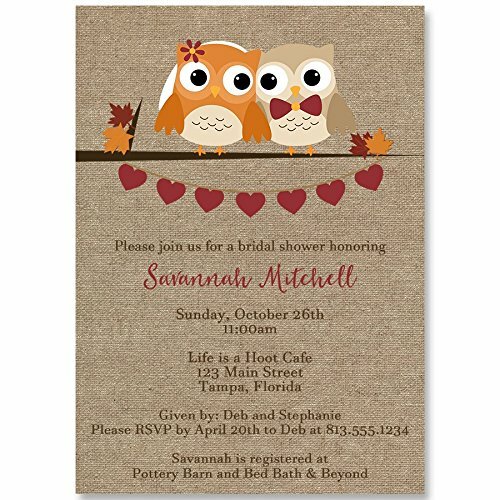 Invite guests to your bridal shower with this autumn inspired design with a bride and groom owl. ♥ This listing is for 10 PRINTED Invitations and 10 White Envelopes. ♥ Invitations measure 5x7 inches. ♥ Proofs are normally sent within 24 hours via Amazon message system for your approval before we print. ♥ PLEASE NOTE: these cards have a "printed effect" to look like burlap, however, no burlap was used it creating them. If you have any questions about this product by The Invite Lady, contact us by completing and submitting the form below. If you are looking for a specif part number, please include it with your message.